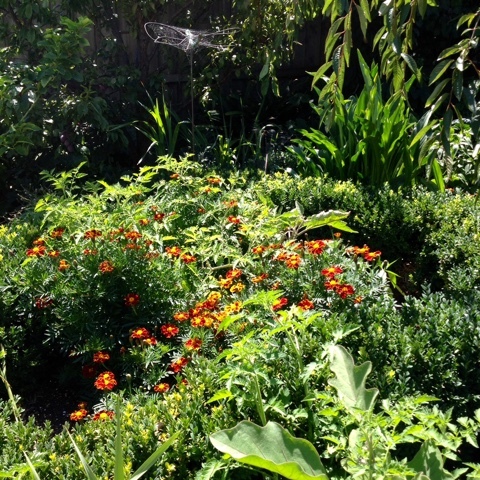 Our summer garden is vibrant with the hot colours, lots of orange, yellow, red. 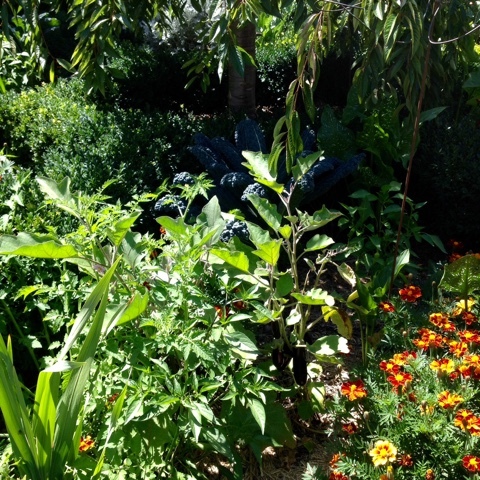 It is also very green with lush foliage for a cooling effect. Mediterranean in style, we have the benefit of both a productive garden and a pretty place to gaze out on. 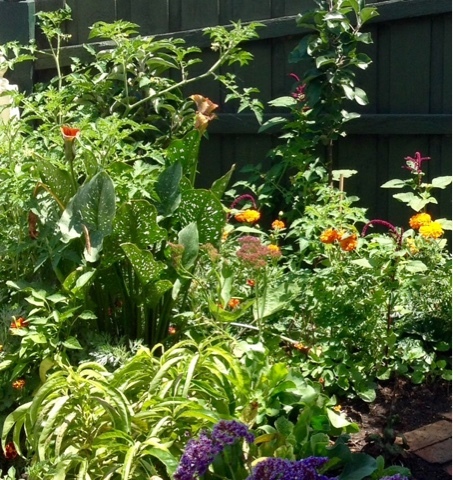 The fence lines are screened with fruit trees and there are lots of vegetables and herbs planted amongst the perennials. 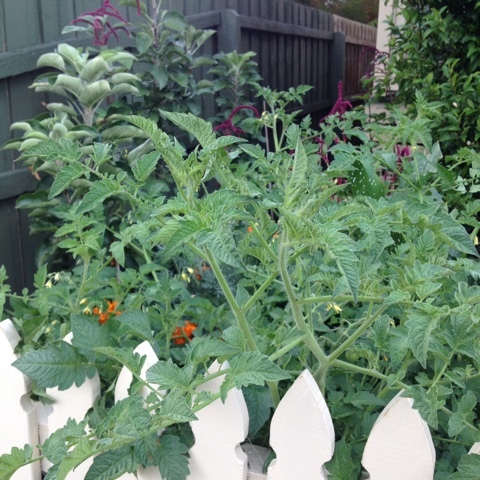 It is a small but heavily planted garden that has benefitted from years of working the soil. 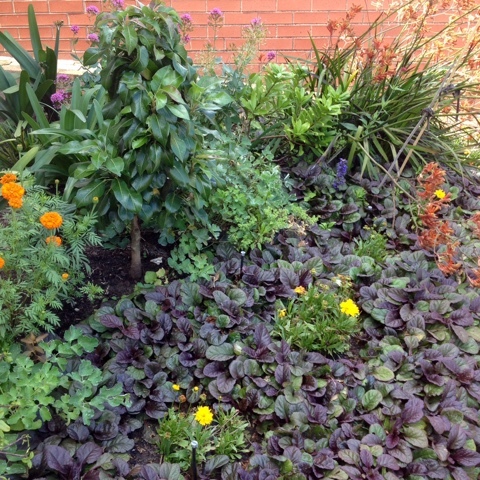 We make and add compost all year round, mulching where needed and feeding from time to time. 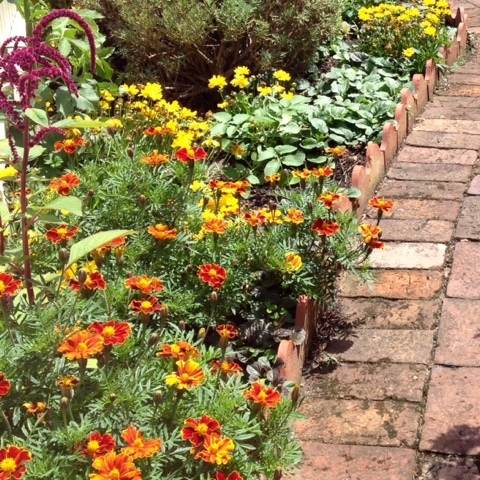 The colours of Summer - Amarath, Coreopsis and Marigolds which are a feature, each year we collect the seed ensuring that there is a plentiful supply of seedlings to plant out. The many shades of green, different leaf shapes and plant size keep the garden interesting to look at even when some things start to die back. 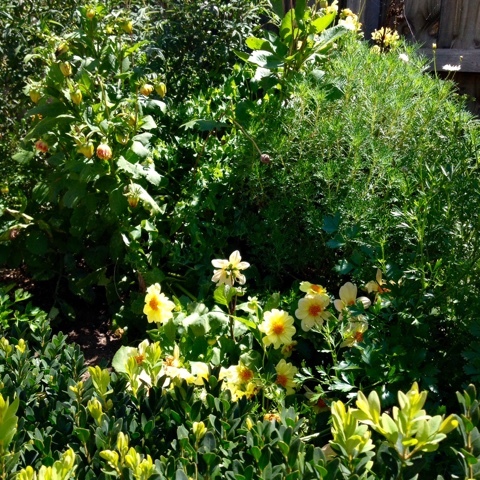 One of the lime trees, under planted with marigolds and coriander that runs to seed and self sows each year. 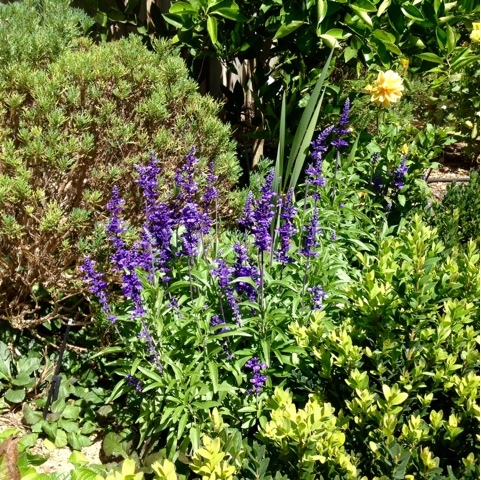 and to this blue salvia planted near the orange tree. This is the view that I have as I cook. 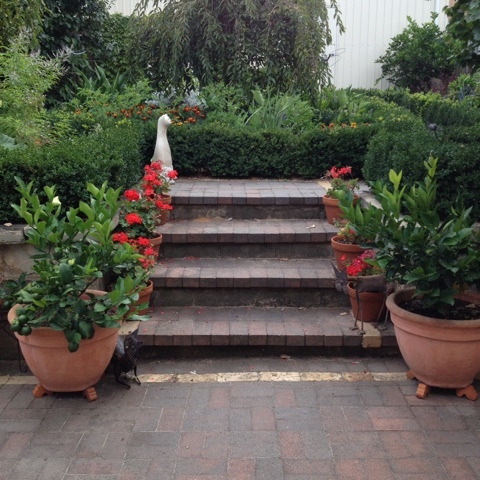 Potted geraniums, the classic red in terracotta pots edges the stairs from the patio to the garden. The dwarf Meyer lemons are quite productive. 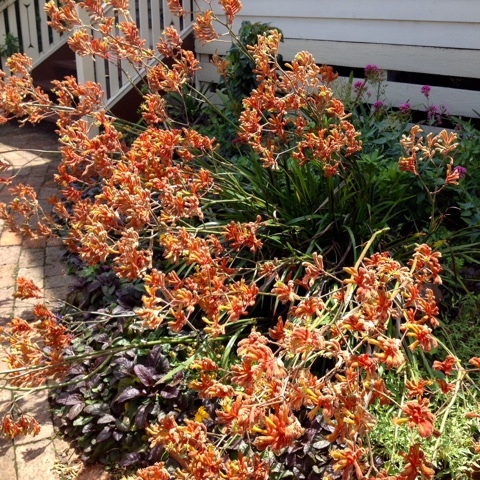 The orange kangaroo paw has been magnificent. 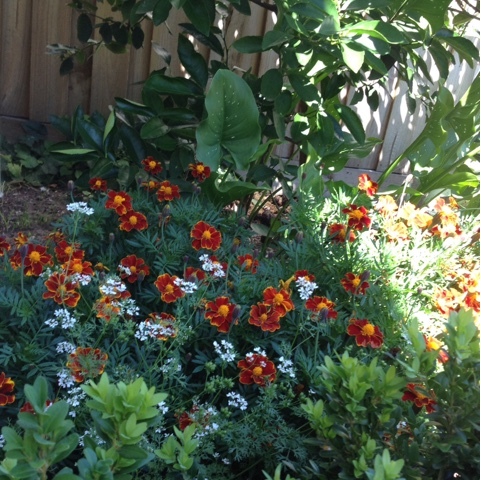 Dwarf pear in front garden with marigolds, kangaroo paw, ajuga and a selection of perennials. 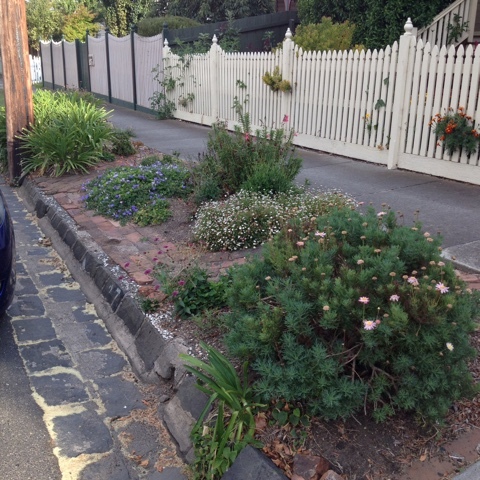 Another section of the front garden and a closer view, Maypole apples on the fence line, a dwarf nectarine, kale and a cherry tomato with lots of perennial and annual flowers filling up the space. 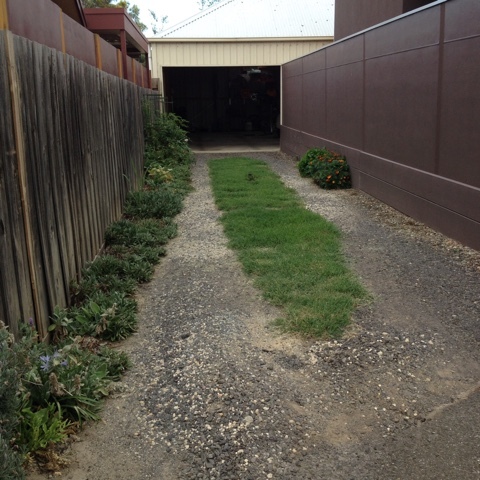 We try to make good use of all our space, this is the rear lane access to our property/garage. 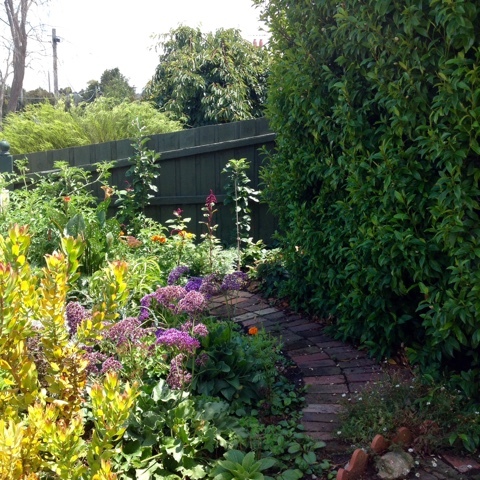 It is very narrow and like the rest of our garden planted with a mixture of vegetables, herbs and flowers. This year the purslane (yes a weed) that we planted and nurtured has taken off, hopefully it will self sow and reappear each Summer. 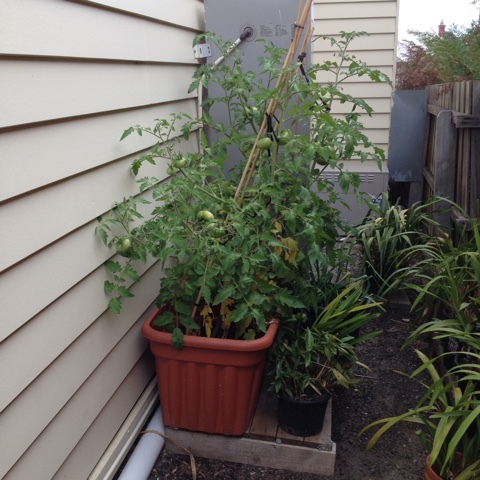 The soil is poor and water is an issue, we bucket water through the garage. 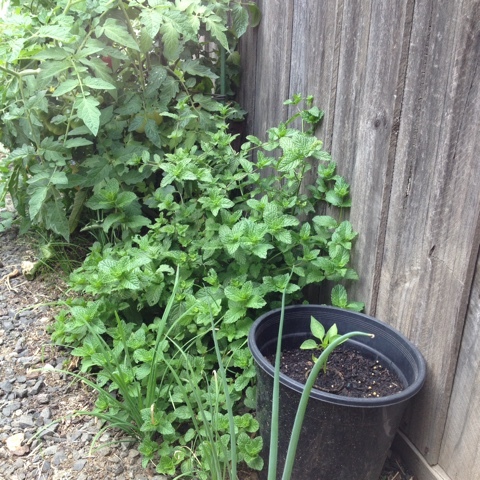 Whatever we plant has to be reasonably hardy. This is the side of our house, another narrow area that houses the orchids. 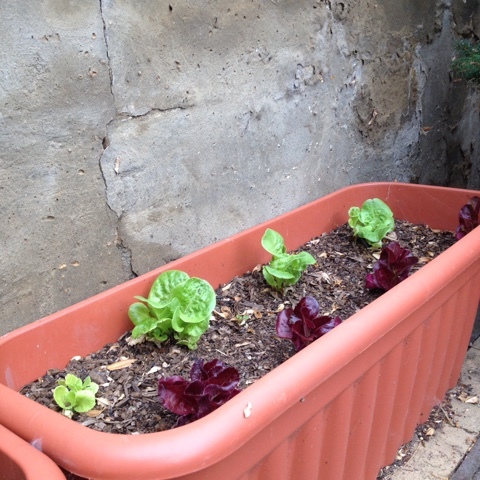 During Summer we also plant tomatoes in big pots and tubs of lettuce like this one that is on the patio. The nature strip continues to be a challenge, once planted as a herb garden but now a mixture of very tough flowering perennials. 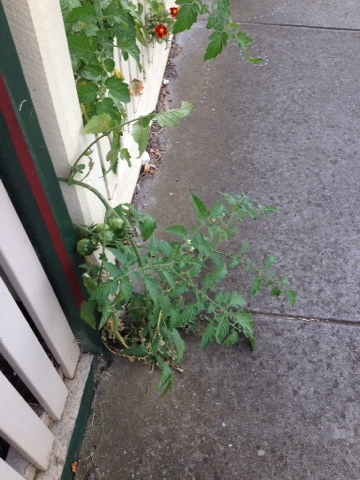 At various times there are plants that escape through the fence. 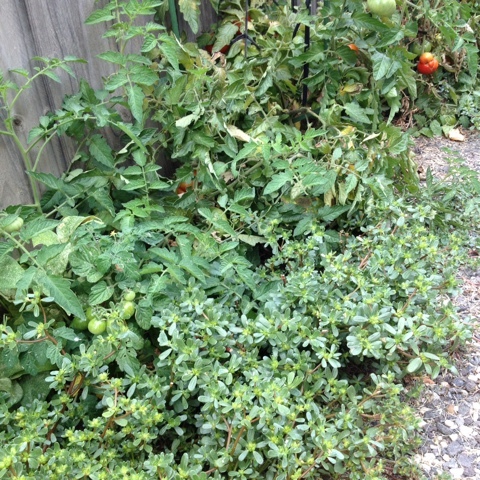 The cherry tomato that most likely came in with the compost is doing very well. Pretty, so nice to look at when we are soaked through from months of cold rain! Do you eat the purslane as a salad green? 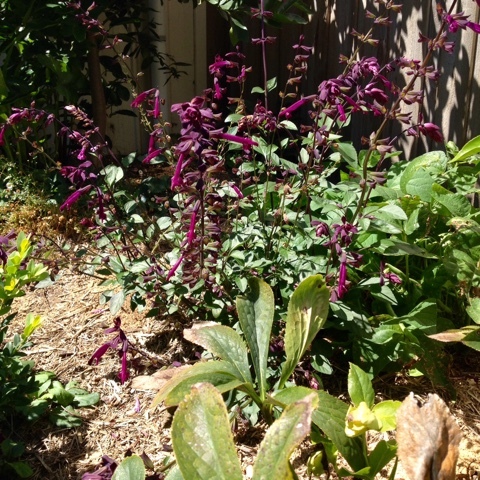 I'm jealous of your salvias… I grow them but they don't thrive like yours. And I love your picket fence! Thank you for your kind comments. I imagine it is difficult with your weather, we have a relatively mild climate, although the long dry Summers are not good for gardens or farm/bushland. Drought is a problem here. Yes, the purslane is consumed as a salad green, much to the disgust of my son. 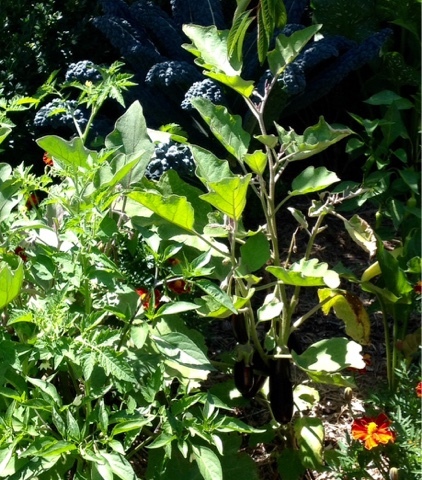 It has a great texture and lovely dark colour that contrasts with the other ingredients in a salad bowl.